Hi, i am Ronan and i quit Clickfunnels for Systeme.io. Want to grow your audience, sell affiliate offers and sell your own products? Here you have an alternative to consider. Systeme.io is a all-in-one marketing tool created by the well known french entrepreneur Aurélien Amacker that makes it possible to create squeeze pages, captures emails, send emails, create sales funnels and webinars, collect payments, have membership areas, run your own affiliate program and much more! All in one! And probably more complete and up to four times cheaper than your current tool! Cheap means bad quality, right? Many people tend to believe a high end price means high quality tool and cheap price means low quality. Creating a tool can be expensive but the maintenance is low price for 10 customers, 1000 customers or even 10000 customers. The platform just needs more space for datas and data is cheap nowadays. What matters most is how much income a tool can generate each month for the platform to pay decent wages to its team of webdeveloper and support team. Many tools out there are out of price! Their owners are just too greedy and they show off their Ferrari while you sweat trying to break even financialy. They literaly cut down your benefits. Instead, a plateform such as Systeme.io took the decision to go cheaper in order to reach more people. Well let’s dig a little bit more and find out what you get for the price. First of all, the tool came out first in France in april 2018. It took 2 years for Aurélien to find the right team to develop it. 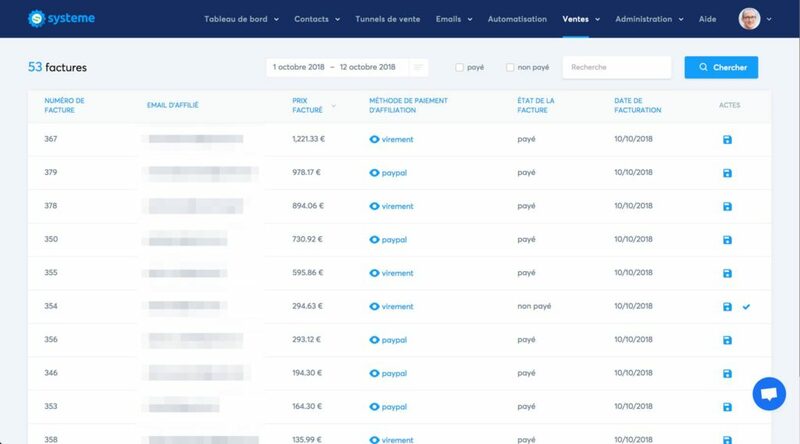 Over 1000 french marketers have chosen Systeme.io to start their business or switched from Clickfunnels in less than 5 months. This is a pretty amazing start and the sign of a new wave in digital marketing. Why 1000+ marketers choose Systeme io as an alternative to Clickfunnels? Wether you sell digital products or services on internet, this tool will save you great time and energy to focus on your business. Click here to try Systeme.io for free for 14 days ! Because Systeme.io makes all of this possible in one place, you can save space on your wordpress or just make your business from Instagram or YouTube without the need of owning a blog. Systeme.io makes things simple and cheaper than their competitors. French people have literaly deserted clickfunnels and learnybox (an other popular tool 3 times the price). So, let’s see a bit more that this tool can do in this review. Système.io : Best budget All-in-one marketing tool? 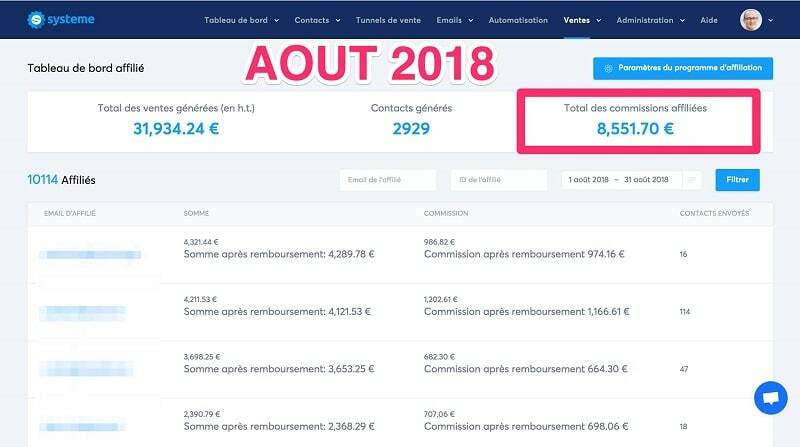 Aurélien Amacker is a six figures internet marketer and Systeme.io is not a hazard. After 1 year trying to figure out how to get the best of the tool, he finaly gave up and decided to hire developers to create a tool that would meet his expectations. 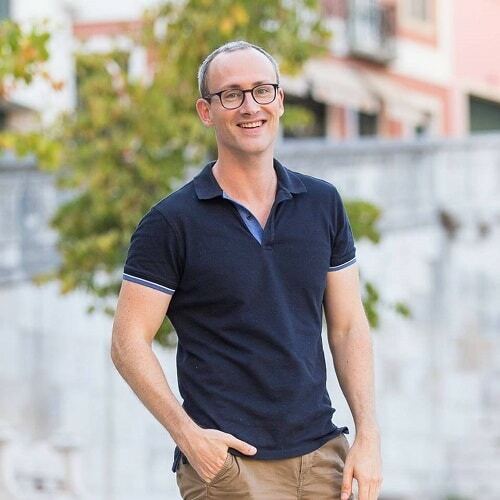 Because Aurélien has tens of thousands of followers, he was able to get a lot of feedback and ideas from real marketers that use email marketing services and sales funnels everyday. After 2 years of testing and development, Systeme io was finaly available to the public in french language. Aurélien started on internet with a blog. At that time in 2010, it was what marketers were being taught, to build your blog. Nowadays, a blog is not anymore the only way to go, specialy for those who are not techy and want to have their business on other media platforms such as YouTube. Systeme.io is a great alternative for beginners because it makes it easy to create sales pages, send emails and receive payments. It is still updating and new functions and templates are added every months with no extra costs. This is the french marketing. There are no hidden costs and no extra fees. 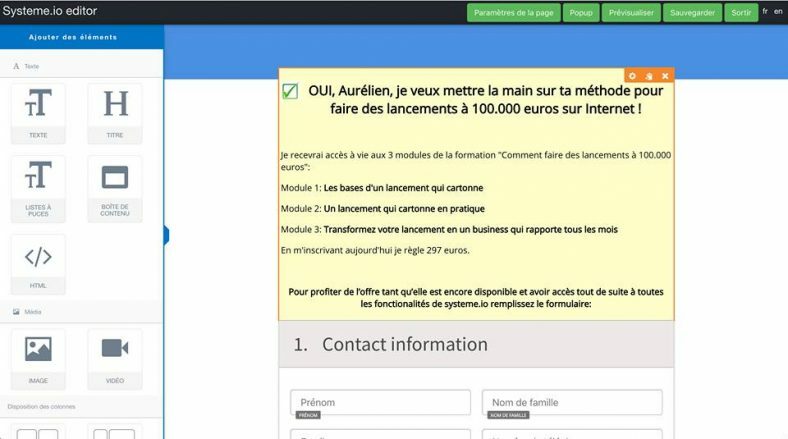 French marketers enjoy this budget tool and make it possible to start a business without the fear of investing hundreads of dollars before making a dime. I am going to tell you the differences but first let’s have a look at something that is very important. Important point, the owner of the tool uses it himself for his many other businesses and even for promoting the marketing tool Systeme io itself. It is important to me that he doesn’t promote his product with a competitor platform because it would mean he doesn’t trust his tool enough to use it. He even recently decided to migrate his blogs in Systeme io. After only 5 months, he already generates 40000$/month with Systeme.io and distribute 10000$/month to his affiliates. By trying the free 14 days period, you can also become an affiliate and earn commissions by promoting Systeme.io. You can sign up here. In my case, i didn’t have any digital products to sell yet. I was just doing affiliate marketing generating trafic from google. But Aurélien had 2 sites and thousands of contacts on Aweber. He then migrated all of them to Systeme. The results were beyond expectation. 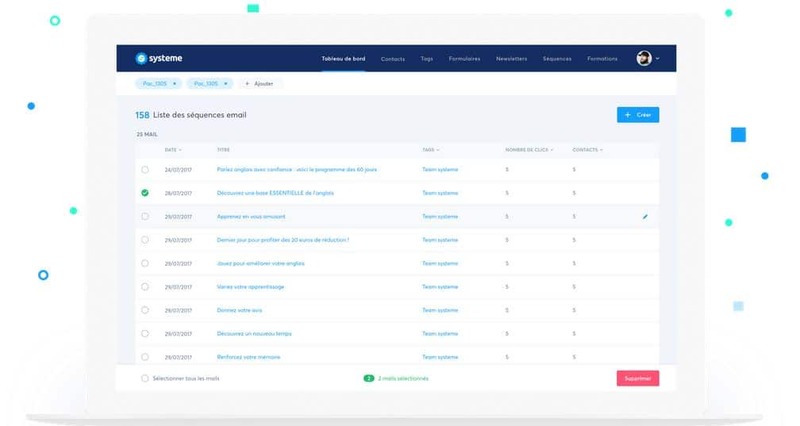 Choosing to deliver emails with Systeme and no more with Aweber, Aurélien noticed a significant increase in email delivery. The natural consequences were more emails being opened, more trafic to his digital products and more money in the bank account. Because Systeme.io uses SendGrid to send emails. SendGrid is one of the best email service provider on the planet. The delivery rate exceeds most autoresponders such as Aweber, MailChimp, ConvertKit, Getresponse and others. Systeme.io is a all-in-one internet marketing tool. No more need to deal with compatibility issues between your autoresponder and funnel platform. 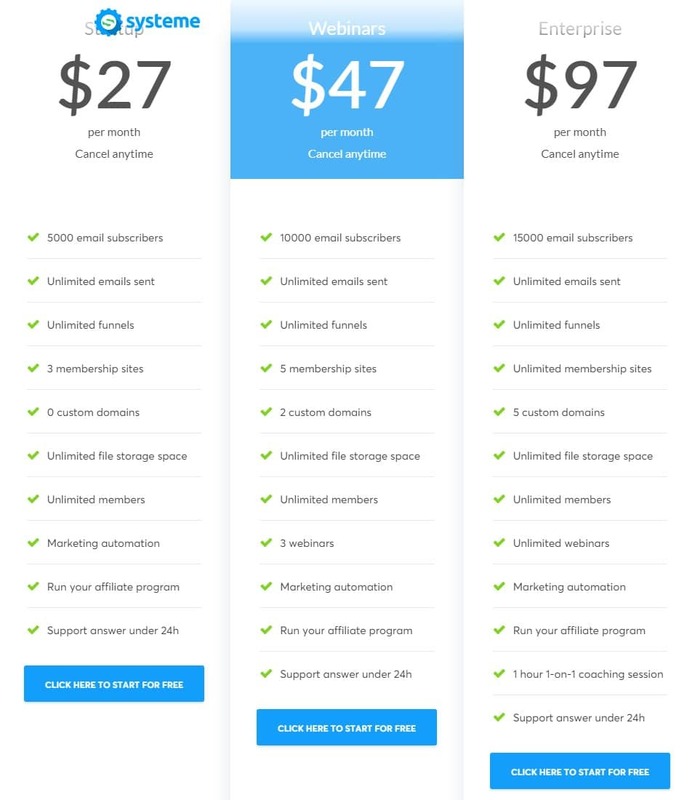 Only the big boys in the industry were compatible but they are too pricy for most internet marketers especialy when you start your business and you can’t afofrd to spend 297$/month for an autoresponder and clickfunnels. The tool, after a successfull launch in French, is now available in english language. The good thing is new founctions are added every month if not every week! In contrary of many other tools online that sell their services at a high price and without asking for a feedback, Aurélien of Systeme.io is open to any feedback. You can email his team about what functions you think are necessary. He wants to make the best maketing tool out there. Aurélien is not financialy greedy and his motivation is to first satisfy customers. This is why he choose to sell at an affordable price. Systeme io includes a complete autoresponder. Thought, if you are used to an autoresponder already, it is different. New contacts don’t go into a specific list but receive a tag. Each contact receive one or several tags. When you send a email, you don’t send it to a list but you send it to one or more tags. This way you can optimize and segment contacts. This way you can select and send a a discount link to your prospects to increase conversions and not let customers know about the discount they missed. The main advantage is that it is simple to handle and very intuitive. No more hassle trying to sort contacts between lists! You set the rules and the software obeys. 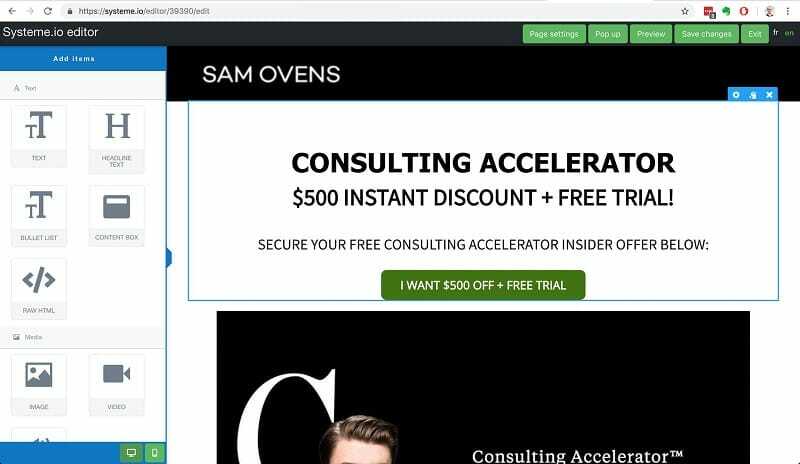 I have used sg-autorepondeur in the past, i can tell you that even after 2 years i was still struggling to segment contacts and change the funnel emails templates. It was almost a nightmare! But i stayed because it was afraid it would be the same if i change autoresponders. My advise is to choose well before starting. Bye bye Clickfunnels, Leadpages, Aweber and others! I seriously don’t understand why no one ever tried to build a all-in-one tool before! Things are way more simple when your contacts, the captures pages, payments and memberships areas are all in one same place! There are 3 pricing plans to start your business. You can try it for free, no credit card asked. This way you can test it by yourself. You can then decide to stop or use it for your business. If you choose to continue, you keep what you already set up. Aurélien decided to do this because he wished in the past he could try marketing tools before paying for it. Some tools were very crappy and unfortunately many marketers exagerate the benefits or lie in the presentation videos. If you are a beginner, just choose the Starter plan, it is enough to start. You can always choose to change plan later if you want to hold webinars or if you need more space or a custom domain. If you are intermediate and already have a blog and want to connect it to Systeme.io or if you want to hold automatic webinars, then choose the Webinars plan without hesitations. If you have an advanced business with many contacts, or like to use automatic webinars or don’t want to be limited with numbers, choose the enterprise plan. You will also be able to save time and get a personal training and assistance 1 on 1 with a staff member. Show or hide elements on mobile devices. June 26 : More datas about your contacts (know when and where a contact optined). The cheapest all-in-one marketing tool of the market ! Nothing compared to Clickfunnels or Learnybox. Thought if you are a beginner, the $27 per month is just fine to start with. The only benefits of the $97 plan to me is the 15000 contacts and the 1 hour coaching. I don’t need unlimited funnels and membership areas. It is a good idea to try Systeme.io for free for 14 days. This is the best way to find out by yourself if it meets your needs before buying. On my side, i find it to be a better alternative to Clickfunnels where the affiliate program was just a nightmare to me. Even if Systeme is not complete yet, it is developing very fast and new functions are added every week. They post the updates on a dedicated facebook group and often run surveys for more functions. Systeme.io is the must go to me for any onyone who considers selling courses online. It is recommended for non-technical marketers that don’t want to spend time figuring things out but instead, want to spend time focusing on making more money. Consider the affordable price and the all-in-one tool. Just great. You make your choice. it is now or maybe never.